It doesn’t really happen anymore that someone on the street asks you if you know the time. Because most of us carry around smartphone wherever we go. One possibility is that it may not cause us so much of a problem even if all the clock in the world decide to take a week off and stop working. That is as long as we have our smartphone on us. It is true some of us check the time on smartphone or computer more than on actual watch on the wrist or clock that hung on wall or sit on desk. Watch sometimes feel like more of an accessory than a necessary item you wear every day, clock an interior decoration. But Japanese stationary company King Jim may change the way we feel about analogue clock. King Jim is very old, well known company in Japan for introducing office filing system. When you think of office stationary and files or binders, you almost immediately think of them. They design and make binders and label-makers. But office scene is gradually changing just as digital technology progresses and a lot of documents are stored digitally in the cloud. Unless it is legal or accounting documents, there is no law forcing them to store physical copies either. Less papers, less needs for filing system. On the other hand, paper planner community is growing with a help of social media. It is as if people are seeking more sentimental value for keeping their memory. Planners used to be something mostly business people or students used so that they can check schedules and keep them accountable for own agendas. People simply used a few colors of pens and a highlighter, and sometimes stickers if they’re feeling fancy. But in the fast growing planner communities, a lot of people decorate their planners as they try to make it ‘pretty’ or ‘glam’. Got it from those phrasing? Yes, majority of the community is made up with women who enjoy making their planners look pretty or glamourous by decorating them and sharing the process and final product through YouTube and social medias. They use all kinds of color pens of many sorts and stickers and glues and wash-tapes. Planners often keep diaries for another way of creative outlet, and they also stick movie tickets or do drawings in their notebooks. They sometimes have tendency to be happy and satisfied complaining about how fat their planner or notebook is that they do not properly close. Anyway… King Jim realized the trend and started designing products with more feminine touch using a lot of bright colors and more sophisticated designs rarely seen in office designs in Japan. HITOTOKI clock is the most recent introduction from them. The brand was introduced to the world in 2017. Hitotoki means moment in Japanese. They started the product line under the name with a concept that every minute and second can be turned into precious moment by adding extra touch. And they targeted both male and female. While King Jim was getting a lot of attention for their ‘feminine’ stationaries used for planners or diaries, two female employees started feeling uneasy about the fact more people were labeling their products as women’s stationary. Their discussion grew into more serious one and started working together for the brand launch. They targeted those who’d enjoy going to art exhibitions and planner or diary. Someone who enjoys both analogue and digital life. Both male and female. They chose gender neutral brand name and design when they set up their website. 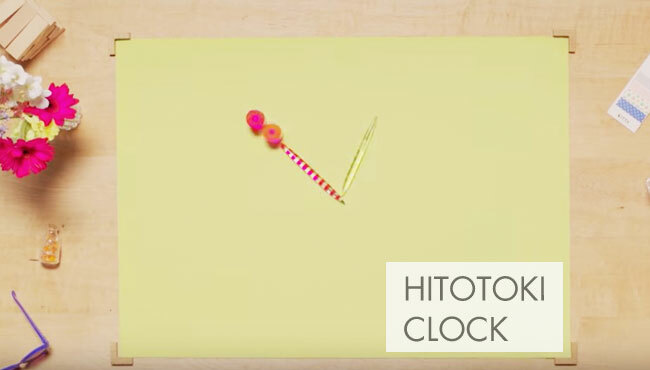 HITOTOKI clock is an analogue clock that can be viewed on computers and digital devices. What is so special about the clock is how the time is displayed. They made every minute appear with different clock hands. How they made this fun analogue clock simply amazes us. They set clock frame on a table and placed all kinds of different objects to address the time and recorded each moment, then put those 1,440 cuts together to create real time 24 hour working clock. They call it ‘hand made 24 hour clock movie’. Check the site below to see how they work. You will be surprised to see how much care and attention are payed to every little detail. They have English site as well as Japanese one. Today in the modern society, people often look for more efficient and rational solution. They disregard a lot of details to cut the time. To achieve even more efficiency, more and more things are consumed and easily thrown away after short period of use. “We wanted to create the world’s most analogue digital content. And we want it to be functional, not just consumable.” The design team also expresses that they think design could make the time more meaningful while the time itself may be but short. What is so refreshing is HITOTOKI clock openly shows trace of human interference to the design. When you watch their movie, you see someone’s hand constantly placing and clearing things and fixing the position. We rarely see it in final products we usually use. There must be someone who’s worked on the design and creation. But we normally chose things according to the usage and final design. There is not a lot of emotional engagement for the design. This is why it gets interesting for their clock. When you visit their brand site, it is not difficult to imagine a lot of their customer base is going to remain women, on the contrary to how they initiated the brand. Their color scheme is very gentle and many of their items come in dots, florals and animal prints which are socially labeled more feminine than masculine. But then again, they have a lot of products that are used in planner community where majority of the members are women. So supposedly both parties win. Planner people would easily find their product fit to their taste. They also have grownup designs as well as pretty ones. Another thing is, you’re once again reminded this is a brand by Japanese company when you browse through their website. There is nothing forced about their design. The design is clean and simple with very delicate touch of colors. For staring new year, why not visit their website below and see if you can get new inspiration for making your planner or agenda more creative and functional?